Fairfield County, Ohio (county seat, Lancaster), formed in the east central part of the state by governor's proclamation in 1800, was the home of a large Mennonite congregation southeast of Bremen during the first half of the 19th century. The first settlers came from Montgomery and Lancaster counties in Pennsylvania after a short sojourn in Rockingham County, Virginia, and a still briefer stay in Greene County, Pennsylvania. The first Mennonites settled southeast of Bremen in the first decade of the 19th century. In the early years German-speaking pietistic groups like the Dunkards and Evangelicals made serious inroads on the membership. The lure of better farming opportunities along the Ohio-Erie Canal a few miles to the west and of cheaper land in northwestern Ohio further depleted the membership. The Civil War hysteria led many young men of Mennonite families to volunteer for military service. Entire congregations of other faiths in this county are now composed of descendants of former Mennonites. Mennonite emigrants from Fairfield County forsook their rugged hillside farms to form congregations in Franklin, Allen, Putnam, and Logan counties in Ohio. Those in Franklin and Logan are now extinct. After the emigrations and defections of the mid-century, the two congregations, one at Pleasant Hill near Bremen and the other at Turkey Run, south of the border in Perry County, suffered from poor leadership and a conservative spirit that opposed English preaching and Sunday school. The Pleasant Hill meetinghouse was abandoned and sold and the one at Turkey Run nearly suffered the same fate but enjoyed a mild revival during the mid-20th century, having 36 members in 1955. Fairfield County was the early home of bishops John M. and George Brenneman and of Elder Daniel Brenneman, founder of the Mennonite Brethren in Christ Church. Other prominent names in the congregation were Blosser, Culp, Funk, Stalter, Sternen, and Sherrick. An Amish congregation flourished in Fairfield County not far from Colfax during the middle decades of the 19th century. Members of the congregation, in search of cheaper land, moved to Logan and Champaign counties, Ohio, during the middle of the century; others moved farther west to Noble County, Indiana, near Topeka, and to Johnson County, Iowa, where they helped to found a flourishing congregation. The last minister, Jonathan Zook, moved to Holmes County, Ohio. Prominent names in the congregation were Bontrager, Gingerich, Guengerich, Hartzler, Miller, Kempf, Plank, and Stutzman. Umble, John S. "Fairfield County (Ohio, USA)." Global Anabaptist Mennonite Encyclopedia Online. 1956. Web. 19 Apr 2019. http://gameo.org/index.php?title=Fairfield_County_(Ohio,_USA)&oldid=113351. Umble, John S. (1956). Fairfield County (Ohio, USA). Global Anabaptist Mennonite Encyclopedia Online. 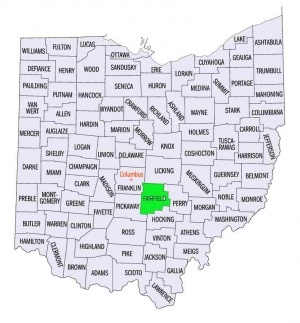 Retrieved 19 April 2019, from http://gameo.org/index.php?title=Fairfield_County_(Ohio,_USA)&oldid=113351. Adapted by permission of Herald Press, Harrisonburg, Virginia, from Mennonite Encyclopedia, Vol. 2, p. 288. All rights reserved.